Hasn’t the weather been wonderful over the last week or so? With the daytime temperature hovering around the mid twenties, strenuous physical activity has been very demanding. Grass cutting has slowed down a little now that we’re enjoying drier days so there’s a little more time for other tasks around the marina. Each mooring bay around the larger Meadows marina is fringed by reeds. They grow at a tremendous rate, as much as six inches a week, so they have to be cut regularly to prevent them from obstructing the pontoons. Firstly they need to be cut with a circular saw blade attached to a trimmer and then some good old fashioned hard labour to collect the reeds with a rake and a couple of dozen builders rubble sacks. On Saturday I usually work on the wharf preparing hire boats in the morning and then instructing hirers on the correct use of their temporary homes when they arrive in the afternoon. Yesterday there were enough staff to deal with the boats in the morning so, aftera few hours very enjoyable weeding, I was on the wharf for when the hirers started to arrive at 2pm. One boat had been hired by a very vocal man and his long suffering wife. They had reversed their car on to the wharf and were loading their luggage onto the their boat (usually enough to keep them going for at least a month). Mr. Vocal came out of his boat and shouted across to fellow instructor Rob and I.
Mr. Vocal was as quiet as a church mouse during his instruction. He was actually very pleasant. His long drive on a very hot day had caused a bit of an upset to his normally placid nature. I love working on the wharf. We have such fun! Yesterday, Saturday, was a beautiful hot and sunny day. The emphasis was on hot. The thermometer just touched thirty degrees. 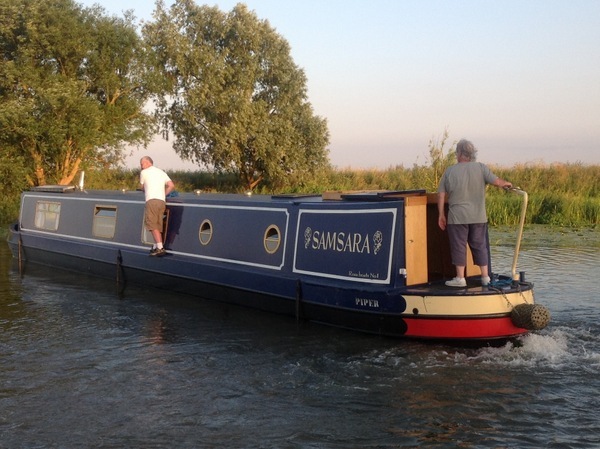 Sally and I decided that the weather was too good to spend on our mooring so we decided to go out for a cruise overnight last night and all day today. Before I finished work at 5.30 we had a surprise visit from Londoner Lucy Illiffe and her mother. They owned James from April 1977 when she was handed over to them from the builder until 1997 when Lucy’s father sadly passed away. Lucy was six when they took delivery of James so she had very fond memories of James spanning two decades. Her visit to the marina to see James was bittersweet. She was pleased to see that James had loving and caring new owners but the memories were too much for her. After a tearful farewell from Lucy we backed off our mooring and headed into the sunset. What a wonderful evening it was for a cruise. Many of the owners of locally moored narrowboats had clearly had the same idea as us. We had to cruise for an hour before finding a decent mooring. Every available spot was filled with happy boaters tending barbecues and sitting in camp chairs sipping wine in the sun. We found a quiet spot just after 8pm. Within ten minutes we were sitting on the towpath enjoying salmon fillets wrapped in bacon, a bottle of Old Peculiar for me and a bottle of Kopparberg mixed fruit cider for Sally. Sally was delighted that she’d found the Kopparberg on special offer at just £1 a bottle. She was delighted until she realised that the cider was alcohol free. You can’t win them all! We’re still there now. It’s 9am. We’ve had our normal full English Sunday treat, Sally’s clipping Daisy’s coat on the front deck and I’m writing the newsletter, glancing out of the window now and then to rest my eyes and enjoying the panoramic view of the rolling hills around Flecknoe. Life is good! 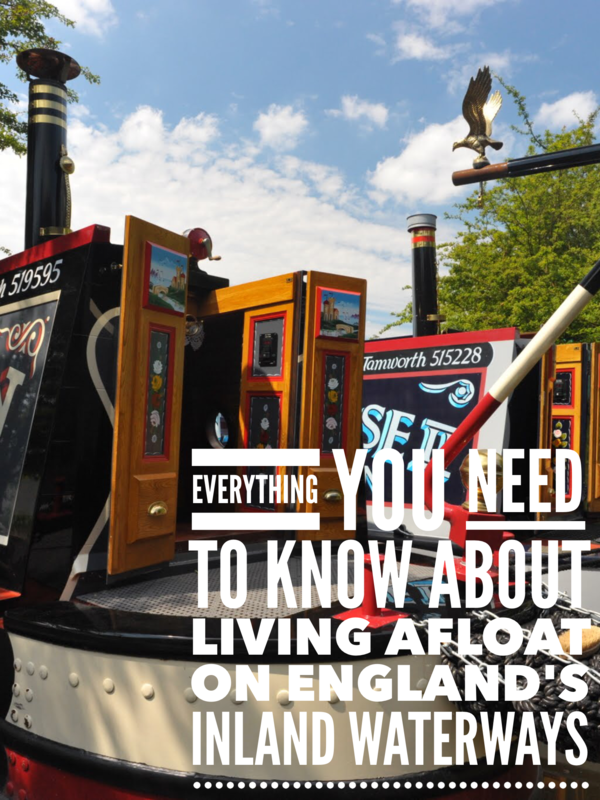 I created the site just over three years ago to provide a source of information for anyone interested in narrowboats and the possibility of living on one full time. The site has grown to encompass a comprehensive listing of inland marinas in England and Wales, dozens of articles, a forum and regular newsletters. I’ve already created (below) indexes of the site articles and the more popular forum posts. I thought it was about time I created an easy to use index of the newsletter content. I’m sorry. I’m only human. Like most people I can’t resist the sunshine. I feel so much better sitting out in the sun with a good book and a glass of wine than I do hunched over my laptop in a hot and sweaty boat cabin. This is all I can manage this week. I’ll complete the newsletter listing next week but, for now, it’s time to cast off the lines and cruise the waterways!